French bakeries and pastry shops are filled with special pastries called les Galettes des Rois. After writing about the importance of family traditions, this new year I wanted to follow an interesting, adorable and beloved French tradition surrounding the Epiphany, a Catholic festival or day of feast. Practicing Catholics or not, almost all French people celebrate the holiday with a Galette des Rois, a flaky crust filled with buttery almond filling. I had never made my own before, but I thought this should be my year to try to for the first time. As ordained by the Vatican, Epiphany falls on January 6 of each year. However, over the years, the actual date of which to celebrate has changed—some families celebrate on the 6th of January while others choose to celebrate on the first Sunday of the month. Nowadays, it’s appropriate to celebrate anytime throughout the whole month of January. La Galette des Rois, (King Cake) is traditionally made of crème d’amandes (almond cream) sandwiched between two buttery layers of puff pastry. When mixed with pastry cream, a common practice in bakeries, this pastry’s filling is also known as frangipane. In France, it’s customary to nestle a fève (historically a fava bean, hence the name), inside the rich filling and crown the finder of this “lucky charm” as “king” or “queen” of the evening. Now, les fèves come in a variety of shapes, sizes, and materials. Some of these trinkets are quite fancy and have become so collectible that the term favophilie or fabophilie has been coined. You can search and find many French websites dedicated to this hobby. 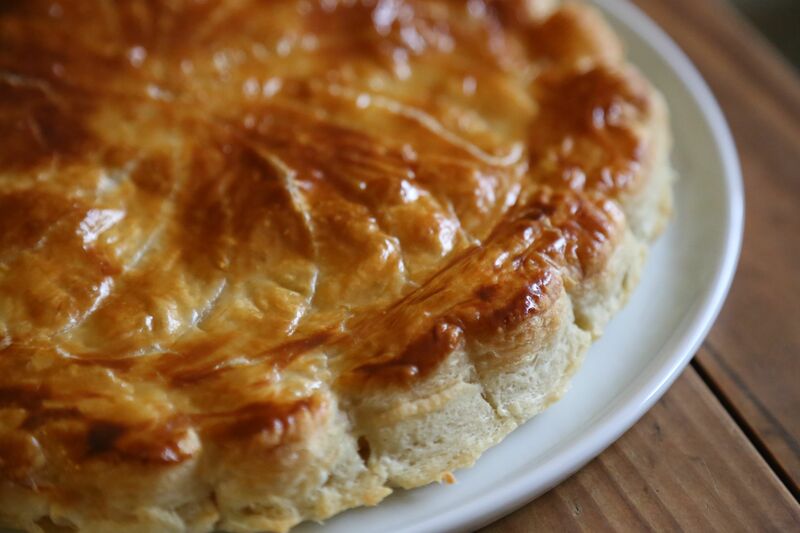 La Galette de Pithiviers – Named for the town (Pithivier) in the north of France where they allegedly originated. This is the traditional one made of layers of puff pastry filled with almond cream. La Galette de Besancon or Galette Comtoise – From the east of France, it is only made from a specific dough and sugar. Le Gateau des Rois – More popular in the south of France, it is a crown shaped brioche, festooned with colorful, sticky candied fruit. They’re all wonderful tasting galettes. Aside from the delicious treat of enjoying a Galette des Rois at this time of year, the very unique and lovely thing associated with it is the family ritual that normally accompanies it. The traditional Galette des Rois is cut in a specific number of slices—at least one slice for each person sitting at the table. The youngest child or person of the family, said to be the most innocent and therefore most fair in the distribution of slices, hides under the table and calls out which slice goes to whom. The importance is given to the distribution because of la fève, hidden in the galette. The lucky person who gets the slice with la fève becomes “the king” for the day. French bakeries normally sell La Galette des Rois with a simple golden crown made of paper and the “king” of the day has the honor and pleasure of wearing it. From the crème d’amandes lovers to the youngest child at the table who delights in deciding who receives each slice to the favophilie, everyone has their reasons to adore this tradition. Both children and adults alike get excited about this annual ritual because of the fun of it. Although becoming a king for a day has no real significance, in the end, the most wonderful and important aspect about this tradition is the gathering and sharing of something fun and delicious with family and friends at the beginning of a new year. 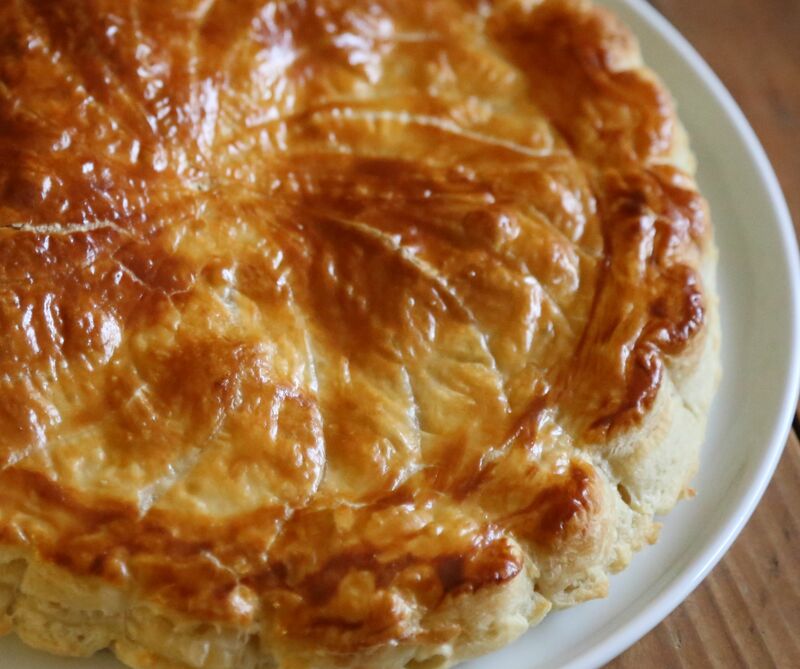 If you’d like an extra special Epiphany treat this month, bake your own Galette des Rois. Preheat oven to 410 degrees Fahrenheit. In a medium bowl whisk almond meal, sugar, salt until combined. Scrape the inside of vanilla bean and add to almond meal mix and mash in the butter until it is completely incorporated. Add eggs, one at a time, until combined then add rum and almond extract. Don’t be alarmed if mix does not look very smooth. This is normal. Cover and chill. Line a baking sheet with parchment paper. Working on a lightly floured surface, roll one piece of puff pastry into a large circle. Using the bottom of a 10-inch springform pan as a template, trim the dough into an even circle. Place the dough on the baking sheet. Roll second piece of puff pastry the same way. Using a pastry bag or a spatula, spread the almond cream over the center of the dough, leaving a 1-inch border. Place la fève in the filling, preferably somewhere closer to the edges. Brush water generously around the exposed border, then place second circle of dough on top of the galette and press down very well to seal the edges. Apply a layer of glaze with a pastry brush and the chill for 15 minutes. Remove from refrigerator. With the tip of a small knife poke a tiny hole in the center. Then, using the back of a knife (the dull side), lightly score the pastry in any design of choice. A quick google search can provide many examples of scored galettes but a few lovely ones can be found here, here and here. Be sure not to press too hard so not as to cut the pastry. Apply another coat of glaze with a pastry brush. Bake for 20-30 minutes. If galette begins to brown too quickly, place a sheet of aluminum foil on top. Martine’s Notes: Making the galette is really not too difficult or time consuming. However, there are a few things you should pay attention to remember: be sure to place the top circle precisely over the first and seal it well so the filling does not leak out. To ensure the pastry rises to its full potential, make sure the egg-wash glaze does not drip over the edges of the puff pastry. Also, I actually weighed each of my ingredients and followed the measurements in grams. Almond meal is basically blanched almonds that have been ground to a fine powder, like flour. I purchased mine already in ground form but you can easily grind your blanched almonds at home using a food processor or high powered blender like a Vita Mix. It’s preferred to use blanched almonds as they say the skin may cause a bit of added heaviness, but I cannot confirm or deny this as I have not tried to make a galette with non-blanched almonds. Variations: There are many ways the recipe for the traditional galette can be varied. For example, you can use hazelnut flour/meal instead. Some add a bit of orange zest to the almond cream and that is very nice. I added both vanilla and almond extracts but only one would suffice. If you don’t want to use rum, you can use brandy or another appropriate liqueur. Consider which kind would blend nicely in terms of flavor. You can also omit the alcohol. Also some people add chocolate or fruit, like apples, to their galette. Feel free to experiment and make it your own galette that you love! Finally, if you decide to make and serve a galette des rois for your friends and family, be sure to warn them in advance about the possibility of biting into la fève, especially if you choose to use something hard or inedible! …and several other sites to view recipe ideas and videos. Hi Pascale. You’re welcome! Have you ever made one before? Lovely background on the holiday. You have educated me. Maybe we can call your blog’s byline “A French Life, Wherever You Are.” I would love to live in France. Gorgeous photo and tasty recipe, too. Funny- I baked a sweet bread/cake with rum today to post on Curls and Carrots. Great minds think alike? I very much like the almond flavors in the galette des rois – the saveur reminds me of marzipan, one of my favorite food memories from Europe. Hi Shanna, Thank you. I’m happy to hear you enjoyed reading a bit of the background. I just updated the post to include a few possible recipe variations for making a galette des roos. Yes, marzipan is quite similar in that it has a base of almonds. Apparently marzipan and frangipane often get mixed up but as you probably already know, marzipan’s corn syrup and additional powdered sugar make it more of a candy while frangipane has butter, eggs, and sugar and is more of a creamy filling. They’re also both the same in that they’re both delicious. The fact that you can associate your marzipan experience with Europe probably makes it a most lovely treat! I’ll keep note about the possible change to my blog’s byline. 😉 Have a great day! The variations looks amazing, Martine. I wish I could make them all! 🙂 Have a great day, as well. Yes! Celebrate all month. I would totally fly in for a galette party! 😉 Hehe. You should seriously have one… The invitations would read: Everyone, bring your favorite Galette des Rois variation and wine or bubbly pairing. Your Galette des Rois looks marvelous, Martine. I did not know of its history/background till this year. Meant for this time of the year, now I know why I saw a few posts on it this week. I will make a note to learn and post it next January! Thank you for the education. Thank you Fae. I’m so glad to hear you enjoyed a bit of the historical background. I’ll look forward to your Galette des Rois next January! the cake looks wonderful (and also pretty complex), have you heard of an American cake that they bake especially during ‘Mardi Gras’ celebrations, also called “King Cake”. Quite different from the ones you have made here! Thanks a lot for helping introduce me to Blue Zone living, it has been very interesting! Hi Izzy, thanks for your comment! Yes, I’m familiar with the Mardi Gras King Cake. I had it when I visited New Orleans many years ago during Mardi Gras.For others readers who may not know about it, you’re right in that it is slightly similar to it’s French sibling (la galette des rois)–not only in name but also because of the trinket baked inside and a similar ritual that accompanies it! I almost mentioned it in my post but in the end decided I could later speak about it during Mardi Gras. Thanks for bringing it up. I will look at your links as soon as I can, However, please know that I am not an expert on the Okinawan diet. I actually know very little about it and continue to learn. In my first post about the Blue Zone, “La Vie en Bleu” (https://petitworldcitizen.com//?s=la+vie&search=Go) I have a link to a National Geographic video/slideshow about the Blue Zones. In it the reporter mentions that sadly, the newer generation of Okinawans are eating more processed foods. This might mean the wisdom, diet and lifestyle the Okinawan centenarians are benefitting from may not be passed down or experienced by this and future generations of Okinawans. Unless of course theres a change. There’s also a link to a National Geographic article. Both are interesting.